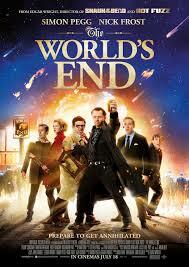 This is the third in a kind of loose trilogy of end-of-days films made by director Edgar Wright and actors Simon Pegg and Nick Frost. It’s a trilogy without recurring characters, but Pegg and Frost end up pitted against some kind of mega threat; Sean of the Dead had zombies, Hot Fuzz had a sinister Neighbourhood Watch Alliance and this has robots. Sort of. Feauxbots. Nobots. Something like that. Gary King (Simon Pegg) is pretty much the most annoying person in the world – a guy in his late thirties who has never been able to beat his best night ever, an incompleted pub crawl with his mates when he was eighteen. So, he gets the gang back together; Peter Page (Eddie Marsan), Steven Prince (Paddy Considine), Oliver Chamberlain (Martin Freeman) and Andy Knightley (Nick Frost). It would end up being just a pretty bad night with the lads until they discover the town’s dark secret. There was a lot in this film to love. Simon Pegg playing the most awful character ever; a group of nearing middle-aged men attempting to beat a power they don’t understand all the time getting ever more drunk; Martin Freeman and his creepy, creepy forced smile. It didn’t quite have the awesome hilarity and impact of Sean of the Dead, but it was a lot of fun. And I kind of like all the not-too-obvious –but-at-the-same-time-not-too-hard-to-miss things for the fans – like the names and the way they relate to the characters. Or the reappearance of many favourite actors in bit parts.